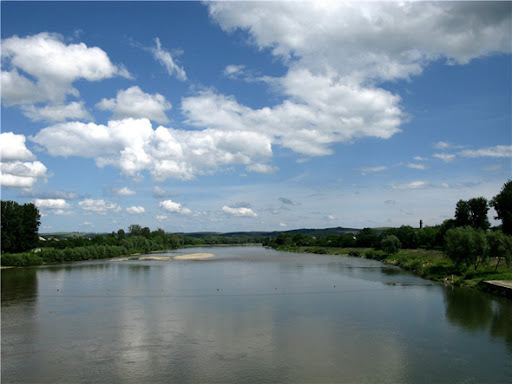 Today Halych is a small (7 thouthand people) and cosy town at the confluence of the river Dniester in Lukva. But once it was the capital of one of the largest ancient principalities and one of the greatest cities on the territory of today’s Western Ukraine. Nowadays only a few things remained of former greatness but Halych continious to fell in love at the first sight and leaves long-lasting pleasant impression. 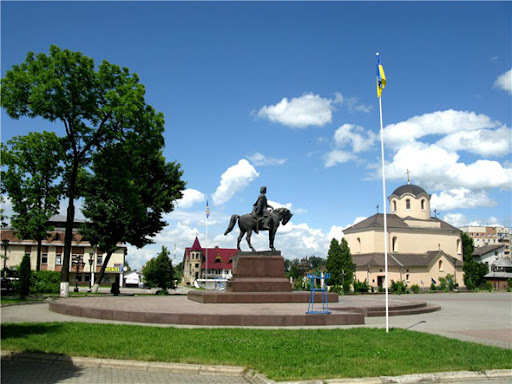 Halych was the capital of the Halych princedom and one of the largest cities of Europe in the 13th century. The center of the old Halych was situated in the territory of the present-day village of Krylos, and the city itself, with adjoining villages, monasteries and castles stretched from the Dnister to the Limnytsa river, which is for almost 10 kilometers, with the population of about 15,000. Nowadays, a historical and cultural park is created in the territory of Halych outskirts and the adjoining villages. This park provides protection to a number of monuments of the state and world importance. 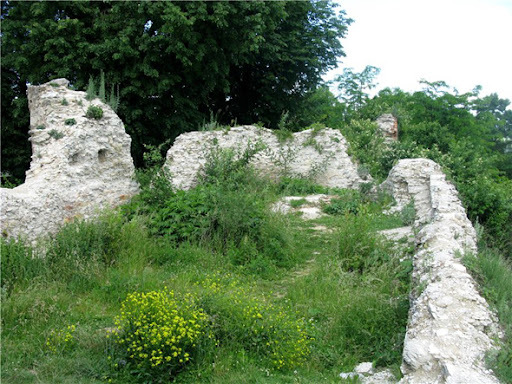 The old Halych consisted of a citadel, a fortified suburb, unfortified suburbs, nearby castles and monasteries. The Citadel lays on an acclivous mountain top in the village of Krylos. Here you can see the foundation of Dormitory Cathedral, which was the main church of the Halych princedom. It was built in the 13th century and finely decorated by glyptics; it is supposed to be taken apart in the 15th century. On its foundations, St. Basil’s chapel was built in 1500 and its stone blocks were used to build Dormitory Church. Together with the stones, it inherited inscriptions and architectural elements of the 12th and 13th centuries. Chambers of Metropolitan (built in the 19th century) are situated near Dormitory Church and in their premises; there is a Museum of the Old Halych History. Right behind the chambers of metropolitan there stands the fortification system of the citadel — six lines of earth banks up to 25 meters in height. Between them stands the legendary Halychyna Grave mentioned in a manuscript of the 13th century. In this grave-mound, archaeologists found a burial of the 10th century — human bones in a burnt boat, arms and a gilded buckle. They believe that the richness of the burial may justify that in this grave, the founder of Halych was buried. Nearby, in the area of the fortified suburb there is a Museum of folk architecture and lifestyle in Krylos village in the open air. There you can see buildings of the 19th-20th centuries brought from various ethnographic regions of this oblast, such as Hutsulschina, Opillya, Boykivschyna and Pokuttya. The present-day Halych is situated where there used to be the prince’s quay in the river of Dnister. 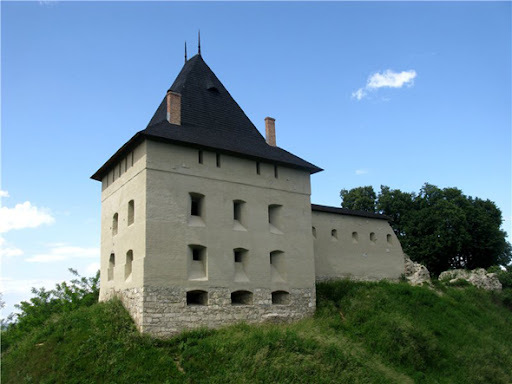 Here, a part of the medieval Old Russian Starostynsky Castle is preserved. The castle was built to protect the quay. It was always important to have a good vision to ensure effective defense, and even now you can see a wonderful view of the river and the city from Zamkova (Castle) mountain! The only church of the Halych princedom preserved in all its integrity is St. Panteleimon’s Church. It is situated in the village of Shevchenkovo, which was once a territory of the old Halych. This is not only a distinguished historical monument but also a fine Specimen of Old Russian architecture a high, stern white stone construction with huge dome. 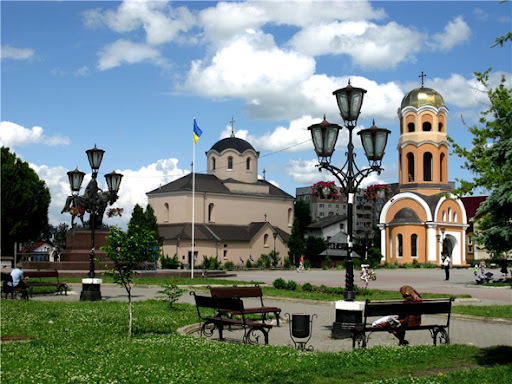 On the right bank of the Dniester River, if travelling from Rohatyn, is located a contemporary district center of Ivano-Frankivsk region — Halych. However, the town is only a nominal successor of the former capital of the powerful Galician principality. The old Halych is situated 7 kilometers from here, in the place of the village of Krylos. It is necessary to begin getting acquainted with the ancient princely capital from here. Kryloska mountain is protected by the river and forests on three sides. That is why the ancient Galician princes chose it as the capital, and the southern open area was surrounded by three rows of defense shafts. All the upland occupied about 50 hectares. It included the Golden Stack-yard — the place of meetings, princely courts and knight duels, bishop’s residence and the city authorities place. 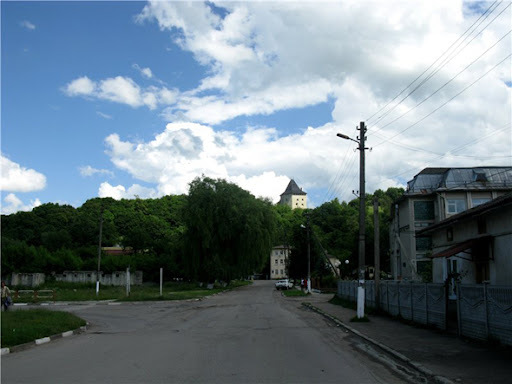 In the lowland area occupying over 200 hectares, in the vicinity — boyar gardens and villages. The area of the mighty Prykarpattia capital was larger than that of the cities of the ancient world — Babylon, Rome and Constantinople. Halych, whose population was less than a tenth of the inhabitants of those cities, in its territory was one of the largest megapolises of the world. The greatest flourishing of Halychyna and the whole Galician principality is associated with the rule of Yaroslav Osmomysl (1153-1187). The Galician principality extended to the Black Sea, it was in possession of Bessarabia, a part of the modern Romania, many Danube cities. It is only due to archaeological excavations that we know how beautiful the architecture of Halych was. Mongolian invasion wiped out about thirty monuments of monumental architecture. Now almost nothing has been left from the princely stronghold on the mountain in Krylos. Only the stone foundations of the once great Assumption Cathedral, built by Yaroslav Osmomysl, have been preserved. The cathedral basement was excavated in 1936 by an archaeological expedition led by Y. Pasternak. In the vestibule of the cathedral, archaeologists discovered a stone sarcophagus with the remains of a highly honored person. They may have been those of Yaroslav Osmomysl. The sarcophagus is now housed in Ivano-Frankivsk regional museum. As a chronicler wrote, in October 1187 Yaroslav, being terminally ill, ordered his servants to give alms to the poor of the capital for three days praying for his sins to be forgiven. Near the foundation, there is an architectural monument of the XVIth cent., the active church of Virgin Mary. What is the most interesting is that the blocks it is composed of first constituted another church — the Assumption Cathedral, in the middle of the XIIth cent., and destroyed by the Mongols. In 1586 its material was used for the construction of the same named church. This can be verified if one discerns the inscriptions of princely times on the walls, inverted in the process of laving. Among the most important monuments of the princely city is the tomb of Halych. Now it looks like a small mound, and was once a high hill, which dominated the capital city as if protecting it. The grave was mentioned by a Galician chronicler of the XIIIth cent. The origin of the burial name as its location remains secret. At 2m. depth, a pagan burial of a noble warrior in the boat was discovered. Iron battle axes, spear tip, arrowhead, dagger, gilded material and gold shield cover were also found here. Researchers believe that this is the tomb of a prince or a chieftain — the city’s founder. The Church of St. Panteleimon, which is located in the village of Shevchenkove (former village of Stanislav), northwest of Halych, belongs to a few surviving monuments of the princely and royal capital. The Church of St. Panteleimon was built in 1194 by the prince Roman Mstyslavovych. The building planning is perfect. The window in the central apse is located so that on the day of Saint Panteleimon here comes the first ray of the rising sun. The stone «archive» of the temple is also unique. It contains nearly 700 murals, which show the rich 800-year history of Halych. For long centuries the building underwent multiple destructions and reconstruction works. Since the second quarter of the XV c. the building was used as a Roman Catholic church of St. Stanislaw. Therefore, the sanctuary retains traces of various architectural styles. In fact, only a part of the western portal, which is a unique example of Galician building school, has remained intact. However, careful restorers have almost restored the original look of the church. In 1991 the church was given its original name — that of St. Panteleimon. 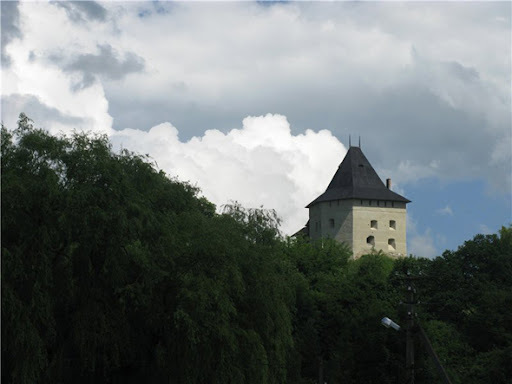 Further we move to the present Halych, where at the entrance to the town one can immediately notice a castle on a high mountain. The castle hill in Halych is a kind of symbol and the town card. This stronghold is first mentioned in chronicles as far back as 1114. In 1658 Galician mayor Andriy Potocki built a stone castle designed by the Italian engineer Francois Korasini instead of a wooden one. In Halych it is worth seeing the church of Nativity (XIV-XV c.), the foundations of which are set deep in the ground at 6.5 m depth. The temple acquired its contemporary appearance in 1904-1906 after the restoration by A. Lewinski. The visitors of Halych also have an opportunity to visit Ukraine’s only museum of Karaim culture. Karaim community of Halych is a unique ethnic and cultural community of Turkic origin with religious affiliation close to Judaism who lived here 700 years ago and left behind rich legacy. Today in Halych no Karaims have remained and apart from the museum, an old cemetery in Krylos, where about two hundred grave stones have been preserved, rekindles memories about them. The oldest of them date back to the middle of the XVII c.
Random excursions variant. Trip to Halych, guided tour through the city center. 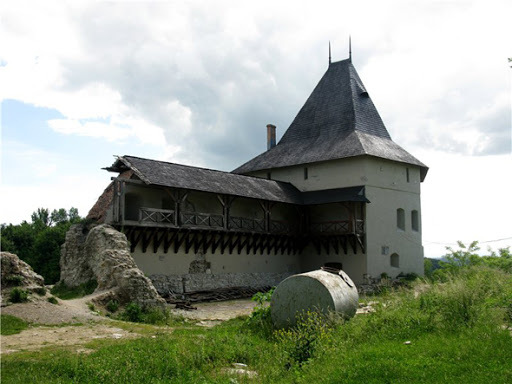 Excursions to the Halych castle, Church of the Nativity, the Museum of History of Halych land. We wish you a pleasant stay in Halych. The princedom existed until 1340 when the boyars poisoned Yuri the Second, the last prince of Halych. According to a personal union between Yuri the Second and the Polish king Kasimir the Third the ruler who died without having an apparent heir had to cede his state to the neighbor. Therefore seeing almost no resistance Kasimir the Third managed the capture Halych lands quite lawfully. However, the Halych aristocracy was punished severely for assassinating their own prince, as upon cession of Halych lands to Poland almost all of them were equal in their rights with common villagers. The blossoming comes to the period of reign of Yaroslav Osmomysl (1153-1187). 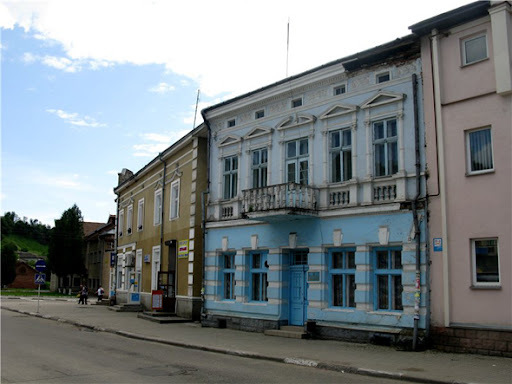 At the end of XII century Halych became the capital of the united Galicia-Volyn principality. The city received Magdeburg rights in 1367. Talking about Halych we need to understand we mean the princely town near the modern village Krylos. On the territory of modern Halych was a port and a small trade-handicraft village. 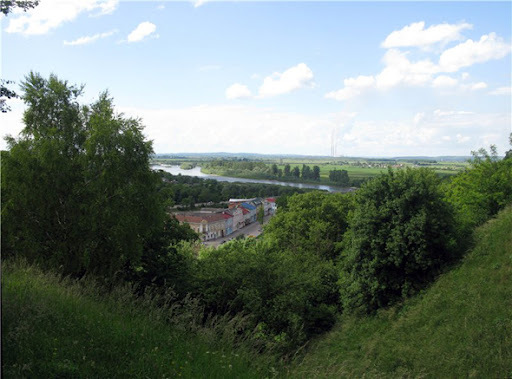 In 1367, here on the high hill over the Dniester river began the building of the castle – the main Galician stronghold. Originally it was a wooden building surrounded by earthen ramparts. In the second half of XVI century the castle was still wooden. During 1590-1633, the Tartars carried out 29 attacks. In 1621, the Tatars destroyed the castle but soon it was rebuilt. Since the mid XVIII century the castle was in a dilapidated condition. In addition, fell down the part of the mountain on which it stood. In 1796 the castle was partly dismantled under the supervision of engineer Hegerstein. But in 1858 the eastern walls came crashing down. A beautiful view of downtown opens from from the castle hill. Let’s descend from the castle hill to see the Halych city center. It is located within a single central square: small but cute and nice. The monument of Danylo Halytskyi (Daniel I of Galicia) was placed here in 1998, on the 1100th aniversary of Halych. The Church of the Nativity (XIV cent.) is a central element of the architectural ensemble of the city. Layout of the Ancient Halych. Old stone houses in the city downtown. 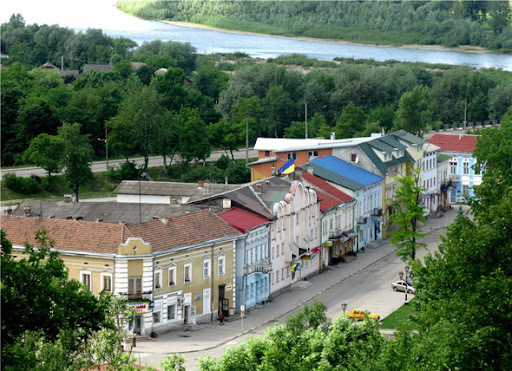 You can enjoy panoramic views of the Dniester from the footbridge in the city center.